Fogazzo Wood Fired Ovens and Barbecues are made of the highest quality refractory materials available anywhere. They ensure that all our wood fired ovens, barbecues and fireplaces will function efficiently for generations to enjoy! Best of all, our products are all 100% made in USA! We’d like to thank Sergio and all the wonderful staff at Fogazzo. Not only did our oven and overall outdoor kitchen project turn out wonderful, but it ended up on TV which made us all very proud! There is no cooking appliance that will give more pleasure to someone who appreciates cooking than a wood fired oven. Pizza is not the only thing you can do in a wood fired oven. Nothing is better for baking bread, and there's nothing like meats grilled or roasted by a wood fire. A wood-fired oven will dramatically alter the way you cook, while providing you genuine enjoyment. A wood fired oven quickly becomes the center all gatherings for friends and family in your home. The sight of flames dancing in an oven provides a sense of well-being and warmth in any kitchen even when not in use for cooking. Incidentally, there's no way that a regular oven will replicate what can be done in a wood fired oven. A pizza cooks in under 3 minutes right on the oven floor. The crust will be crisp on the bottom, and the toppings always come out beautifully melted, and perfectly cooked. All Fogazzo products are designed to be easy to install using most types of common construction methods and materials. Commonly, installations are completed using a combination of materials such as brick, masonry, concrete, light gauge steel, ceramic tile, stucco, brick veneers, etc. Complete installation instructions are included to guide you step by step in the assembly of any of our kits. 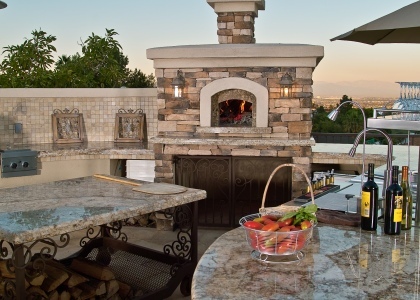 Visit our installation gallery for inspiration for your outdoor kitchen project. 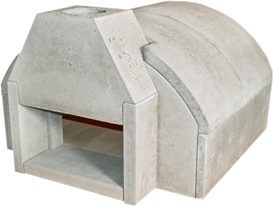 All Fogazzo products feature easy to assemble components cast using our proprietary refractory mix and real firebrick Additionally, all our products feature castings made from high thermal resistance materials Proven, heat-efficient dome design for our ovens. Combination flue/hood optimally placed for efficient smoke removal. Steel oven door with handle for our ovens. Thermal heat blankets for added efficiency of all products. Complete installation instructions for easy assembly and 1-Year limited warranty on all kit components. Be sure to visit our pizza dough recipe, pizza recipes and food pictures pages. These pages contain dozens of tips and recipe ideas you can use everyday either in your conventional kitchen or in your outdoor kitchen or brick oven. Fogazzo has several tasty recipes including a way to make Catupiry (soft cheese) at home. If you get a chance, be sure to visit both our Firewood page and, our Starting an Oven page which will give you the technical know-how you will need in order to choose the right types of wood for your oven and how to start a wood fired oven quickly and easily.